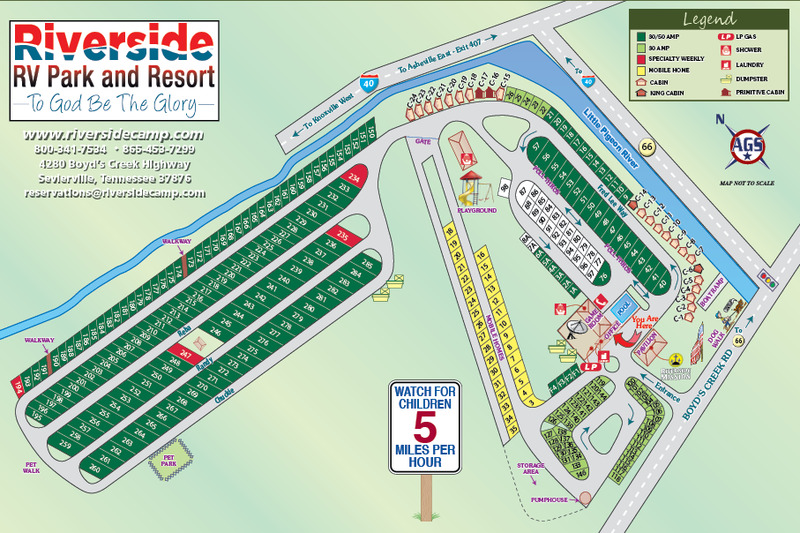 Ask fellow campers about "Riverside Campground & Resort" and nearby attractions. Fantastic campground. Most all types of campers would fit in here and be able to find something to do. The spaces are long and wide in the section we are staying in, and we also have enough room to park our truck in our site. They now have a dog park for your furry friends as well. If you like a campground in the shade, they go you covered, and if you like wide open spaces without the trees they got you covered on that too. I highly recommend this campground. We camped at Riverside Campground & Resort in a Fifth Wheel. Upon entering Riverside park there is not a lot of curb appeal at least not in November. There is a slightly steepish, turning entrance and you pull up in front of a small building. We had reserved ahead, and the check-in was quick and functional. They give you a map and off you go to your site. There are back-in sites along the river but they are rather short. We witnessed a long 5th wheel trying to get into one of these sites, and he used several opposite (luckily empty) sites to back in. And his back end was almost over the river. A small motorhome could pull in but would have to run utilities underneath. Our pull-thru site was narrow and flanked by trees so we had to jockey a bit to get situated. It would have been a challenge with the tow hooked up. The site left little room for our tow vehicle even with parking it sideways. If you want an overnight and don't want to unhook specify a pull-thru without trees. The sites are all gravel and pretty level. There is no privacy just a little grass space between sites with a picnic table. It was raining when we arrived and there was lots of standing water in most sites and the interior roads. It was not crowded when we we here and it was quiet. Internet works pretty good although it slows down here and there. Directv would not lock in due to trees in our site but would have in the pull-thrus without trees. They do have cable. Verizon was strong with 4g - 3 bars. We found it to be pricey, even off season, for what you get. Although they advertise that the park is strictly a nightly vacation park there are permanent double-wides in the middle of the park. And yes, the park is located near Gatlinburg but the traffic to get there is horrendous. We attempted to go into Gatlinburg which would have taken 1 ½ hours to go 18 miles! We passed on that! BTW if you like to consume adult beverages come fully stocked - there are only a couple of liquor stores in the area. We camped at Riverside Campground & Resort in a Motorhome. This was a very nice RV Park. Though we were only there for an overnight traveling through to return home, we were very pleased with what this park offered and will definitely be back. At another time when we can enjoy all that this area has to offer and the weather is not so cold, I'm sure that we will stay for awhile. The staff were very friendly and courteous, both when calling for a space and at check in. Our site was easy to get into and out of, was on an end cap with no one next to us, and was level. WIFI worked well. Actually, given the time of the year and the weather, there were only a few other RV's. A river runs beside the campground and some of the cabins with decks were right over the river. The campground has all the amenities needed. We camped at Riverside Campground & Resort in a Motorhome. We stayed 6 nights, make sure you visit the Bush Beans Museum, just be ready for heavy traffic. We camped at Riverside Campground & Resort in a Fifth Wheel. There are plenty things to do, but the traffic is a nightmare! This is a very nice place to stay while exploring the Gatlinburg/Smoky Mountains NP area. 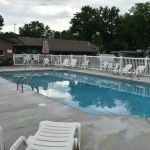 The park was clean, the staff was friendly and professional, and sites were level. There are pull through sites, but we selected a back-in site that gave us a nice backyard on the river. The sites are a bit close, but that's to be expected in a "resort" area, and they weren't too close to be uncomfortable. The roads in the park are very wide and easy to maneuver for any size rig. They are gravel and are well maintained. We liked that this park is close to I40, so you don't have to drive through all of the high-traffic tourist areas to get there. And, you're not that far from Pigeon Forge and the National Park to enjoy those areas. It was nice to be in a more quiet area when running to the store or to get gas. Verizon cell phone service was good. We used the cable somewhat, it had limited channels. You should have good satellite service given the park layout. Hookups were in great shape and within easy reach of the Motorhome. We enjoyed our stay, the view of the river, and would definately return the next time we visit this area. We camped at Riverside Campground & Resort in a Motorhome. There is so much to do in the area it can be overwhelming. If going to the National Park, be sure to use the bypass around Gatlinburg. We had a great meal at a new place called The Local Goat. Recommend the Roaring Fork Motor Tour in the National Park, not as used as Cade's Cove. Nice, large, campground. Well laid out and super easy for big rigs. Large pull thrus are available. Utilities are solid although we did not try the cable as we used our satellite. Wifi is surprisingly good for a packed house on Saturday night. 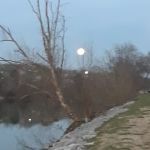 Seems to be lots to do for families and it is a short,( but not fast) drive to Pigeon Forge and all the touristy stuff. We camped at Riverside Campground & Resort in a Motorhome. Park is very clean and well laid out with wide streets. They offer both pull-thru and back-in sites. Our camp site was level, with dirt & gravel, 50 amp service, and picnic table. It also was longer than our 40ft motorhome with toad and plenty wide. There were trees around but our site open so able to get satellite service. We also had good Sprint and ATT cell service. We camped at Riverside Campground & Resort in a Motorhome. We were only here 1 night but would certainly stay at Riverside again. Our site was not right on the river, but there was easy accessibility to benches and even fire rings along the water. It's easy to see this is a family oriented campground promoting a wholesome atmosphere. We camped at Riverside Campground & Resort in a Fifth Wheel. In Sevierville you're surrounded with a variety of restaurants, shops, and interesting things to do. Nice quiet place and not in the middle of the Dolly tourist mess. Sites are gravel and mostly level. First site we tried was off level a good 6 inches side to side. Mowed grass clippings were constantly tracked in. Ask for a satellite friendly site. Not far from I-40 and you can drive to the tourist area. Sewer pretty far back when you pulled forward to exit on the patio. Took two lengths of sewer hose. We camped at Riverside Campground & Resort in a Fifth Wheel. One of our favorite parks in the country! Lovely shaded areas next to the Little Pigeon River. Convenient to shopping and Great Smoky National Park. Roomy spaces that are level and very clean. Staff is super and the new bathrooms are fabulous - nicer than most hotels! Love this place! We camped at Riverside Campground & Resort in a Travel Trailer. Check out the Bushes Beans Visitor Center near Dandridge! This is one of our favorite places to stay. Folks at campground at great. Parking in back in 250-260 area with lots of green for dog to run in. Far enough away from tourists traps but close enough to everything. Great diner down the road, Pilot truck stop within .5 mile and close to Interstate. We camped at Riverside Campground & Resort in a Motorhome. You can do all the tourist things in Pigeon Forge or Gatlinburg or just chill out in Seveierville. Must eat at Old Mill Restaurant, but choose your time and day according to the traffic. Stayed in a 34 ft. travel trailer for a week. This is a great location to Pigeon Forge. It is located away from the traffic, but very accessible to it. Bathrooms are air conditioned and VERY clean. 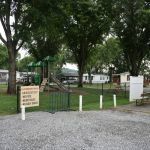 It is a quiet campground with lots of green space to walk pets. WiFi was excellent and so was the cable, even when the weather was stormy, we never lost electricity. Downside, there are only four washers and dryers for the entire campground and it is not opened 24 hrs. We camped at Riverside Campground & Resort in a Travel Trailer. This big rig friendly park has very easy access from I40 and hwy 66. It has a very peaceful setting next to the Little Pigeon River. All the sites are nicely manicured and very clean. The staff was very welcoming and helpful. The riverside sites are shorter and may not fit a big rig; however, there are plenty long big rig sites thoughout the park. The roads are very easy to maneuver. All the connections are properly placed and easy to hook-up. The park was very quiet and peaceful during our stay. This park's weaknesses include a lack of shade away from the riverside sites, sites are close together, and the sites are gravel and not always level. Our site, 243, was level front to back but was low on the driver side and required 2 "lego" blocks under the tires. This is a park I will definitely return to and would gladly stay for a week or more. We camped at Riverside Campground & Resort in a Fifth Wheel. Very nice site along the Little Pigeon creek. Check was easy and very friendly. Our site was a back in with a view of the creek. Stairs led down to a fire pit with lots of room to sit right at the creek. We had cable and free wifi which was off and on useful. Site was level with room for our slide on one side and awning over the picnic table which was on a concrete slab. Site was level with minor adjustments. They have a very nice pool and clean playground. Our site was nice and shady. Restrooms and showers were very clean and we watched workers level and add pea gravel and level other sites. We camped at Riverside Campground & Resort in a Travel Trailer. Explore Pigeon Forge, Gatlinburg, and drive the roads thorough the Smokies. Saw a black bear with two cubs! The front part of the park has plenty of shaded slots; which is nice. The back part of the park is newer and lacks the same appeal as the front half - but it's still a very nice park. Overall the other campers have always been friendly and the staff is mostly friendly. This is a convenient place to stop for us when traveling and they offer late check-in if needed. We would definitely recommend and will be staying here again in the future. If you get a chance, drive up to Clingman's Dome. The observation tower is closed for repairs until April 2018, but the views are spectacular. LOTS of things to do in the area, I wish we would have been able to stay longer to see all of them! For groceries & fast food, turn left on Hwy 66 (Winfield Dunn Hwy) instead of turning right and going into Sevierville or Pigeon Forge. There is a Food City & Burger King, among others. Much, much easier than going into Sevierville/Pigeon Forge. Dollywood, Titanic museum, Smokey Mountains. This is very close to Pigeon Forge (Dollywood), Gatlinburg, and Smoky Mountains. Don't miss the Titanic Museum. It's incredible. Lots of other things to do in Pigeon Forge as well. Sevierville is a great little town. Home to Smokey Mt Knife Works and near Dollywood. Also found a great vet just down the road from the park, Dr Bea Moody. We used alternate routes into Dollywood, Pigeon Forge, and Gatlinburg. They are faster and not so laden with traffic. Close (3 miles) to shopping and food about 7 miles from Dollywood. Smokey Mountain Knife Works was just around corner. Tony Gore's BBQ place is just a mile down the road. Great food! Pilot station at entrance to Boyd's Creek Highway won't work for a longer motorhome with a toad. There's a traffic light at Boyd's Creek Highway. This is important because making a left turn onto the Parkway would be a major challenge. Sevierville TN is neighbors with Pigeon Forge TN. Many, many attractions including Dollywood. Plenty to do and see. Close to the Smoky Mountain Knife Works, the Coleman Outlet Store and others. Cade's Cove is worth the trip. Close enough to Pigeon Forge and Gatlinburg without being too close! Outlet mall nearby, excellent restaurants, national park 15 miles away. 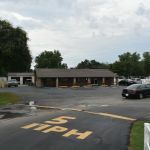 RV park location is near Severville, Tenn. and convenient to restaurants, shopping and the beautiful Smokey Mountain National Park. You're just down the road from Pigeon Forge. We ate one night at the Outback, but there are plenty of major name restaurants. Nearby are many shows, dinner shows, and attractions, to keep everyone in the family busy. The Smoky Mountains National Park is not far. 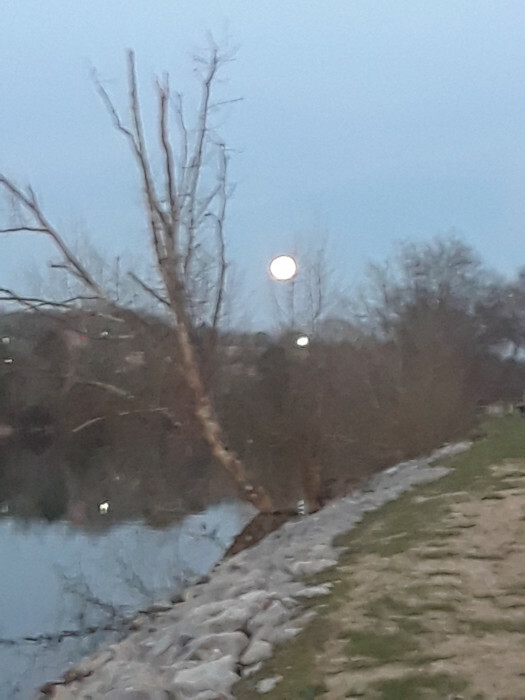 IF you like to fish, some had brought small boats to go down the river in, and also there is a Bass Pro shop a few miles away. If you're going to the national park leave early - later in the day the traffic gets crazy. This applies also for going into town for groceries, etc. You are close to all kinds of shopping, shows and just about anything else you would need. 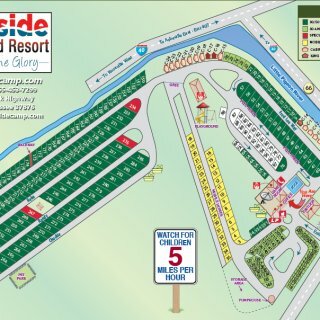 Are you affiliated with Riverside Campground & Resort ?